On Wednesday evenings that we gather as a student community for fellowship, food, and reflection. 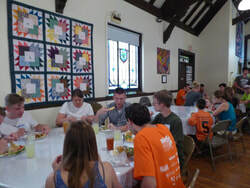 Dinner is served at 6:00 pm in the University Lutheran fellowship hall. Those with an exam or other evening commitment are placed at the front of the line. We share a devotion, song, and a program follows.